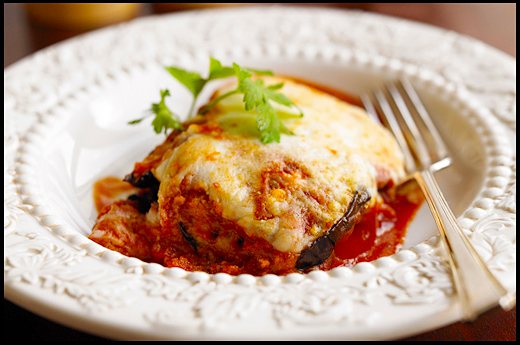 I never liked Eggplant Parmesan growing up. My mother would cut thick slices, cover them in bread crumbs, bake them, and then add Hunt's tomato sauce from a can and not nearly enough cheese for my taste. But then I had the courage to try it again at an Italian family reunion. I was stunned that it could be the same relative ingredients yet taste so different. So good! So I tracked down the cousin responsible and got her general description and recreated it. It was good! It's a little labor intensive, but worth the effort. This recipe is for four people, with no leftovers. I tend to double it and then have leftovers, but then, I always seem to cook too much. 1. Slice the eggplant as thinly as you can by hand (a mandolin makes them too thin), place the slices in a colander, add salt, and let them sit for a bit while you get everything else ready. 2. Get a large cast-iron pan and begin to heat on the stovetop; cover the bottom in olive oil and some sliced garlic. 3. Next to the stove, put the flour in a bowl and the eggs in a separate bowl and stir the eggs. 4. Rinse the eggplant and take each slice (yes, EACH one) and cover first in flour and then in egg and put into the pan to fry. Turn over each piece and sprinkle with a bit of Romano cheese (it's better than salt). Continue until each piece of eggplant has been fried up. NOTE: This is the labor-intensive part, but it's totally yum and worth it. You can use these pieces for all sorts of other recipes, too, or just eat them as is. 5. As the pieces are done, layer them in a casserole dish. 6. Halfway through, add half the shredded mozzarella and half the sauce. 7. When all the pieces are in the casserole, add the rest of the cheese and sauce; end by sprinkling the cheese on top. 8. Bake in the oven at 350° for about 30 minutes, or until the top is golden and bubbly. For family reunions, double, triple, or quadruple this recipe!